Michelangelo is best known for his incredible frescos in the Sistine Chapel. But he didn’t enjoy painting. He really didn’t want to do the chapel ceiling. He was coaxed into it, and he sometimes complained and felt resentful. His body took a pounding due to the strange posture that was necessary to paint a ceiling. His face was covered with paint drips at the end of each day. He was very unhappy. But, he did a great job because he was a perfectionist; and he paid a personal price in his health and happiness for doing something that he didn’t really love. His description of painting the ceiling reminded me of my days as a CPA. I was a damn good auditor. People even said I must have been born to do that work. I did an admirable job because I was responsible and a perfectionist. But I didn’t love it. I didn’t wake up looking forward to my days. I came home each day exhausted and feeling like something big was missing from my life. What Michelangelo loved was sculpting. These are his words. Yes, sculpting was Michelangelo’s true love. When he looked at a piece of marble, he saw the statue already inside the marble. Then he just had to chip away anything that wasn’t the statue so we could see what he saw. He was not worried about chiseling the wrong thing. He knew exactly what to do. Our true work is just like sculpting to Michelangelo. It is easy, natural, and so enjoyable. A true singer hears a song in a beautiful way, and they bring it to life so we can enjoy it too. A real comedian sees something funny, and they let us laugh with them. An inspired inventor sees a new product, and they give that product life. A free artist paints or chisels their pure and beautiful inner vision. By bringing what the creator sees within their mind into the physical world, we get to see it too. They give us a bridge into their world. It is a gift of love. I immediately identified with his way of seeing; and I saw my life in a whole new way. I couldn’t sculpt if my life depended on it. But when I look at a person, I see the True Self that lies beneath all of their beliefs. If they are willing, I show them how to discriminate and let go of that which is not true. As the dust of their beliefs falls away, their True Self is revealed. It is effortless, enjoyable, and I know I cannot make a mistake because I see and feel it so clearly. Likewise, when I sit down to write, and I bring forth whatever is in my mind, it is enjoyable and effortless. But if I try to say it so that others will understand it or so they will not judge what I write, the effort creeps in and the joy disappears. Michelangelo tells us the difference between true good and crazy evil. He said that he sees the statue already there, shaped and perfect in attitude and action. That could be a line from the Bible. It is so pure and sweet. His inner eyes see something that is perfect although not yet material, just as we might imagine God seeing the earth before it was created. He goes to work to make the stone match the perfection in his mind. On our best days, that is what we all do. Evil does the opposite. The evil part of our mind sees problems and flaws; and then it prompts us to tell the rest of the world to see that flaw or problem. It tries to fix the flaw. It doesn’t want us to let the flaw go and cure it. The false or evil part of Michelangelo would tell him it is just a big stone. It would say no one gives a damn about what he sees in the stone. It would tell him not to waste his time. Evil is our inner marketing machine that promotes the problems it sees to the rest of the world; it is misery that loves company. Just yesterday, I heard a speaker say that “good” marketing is making sure that people feel their pain. Good politics tends to be the same. Good marketing and good politics are evil with a great mask. The only reason to feel our pain is to get rid of our pain, not to fix it with their solution. Evil is a leader without a pure and loving vision in his or her heart; a leader that focuses on and fixes problems is not a true leader. Before I set my mind straight, I often saw problems and flaws as real. And that evil point of view was harmful to me and others in my life. Letting go of that impulse to focus on problems brings me peace and joy. It chisels away the dross leaving the gold behind. We all have good and evil points of view until we cure the evil ones. Michelangelo saw perfection in the marble, but he saw evil in the church. That is why the job was so painful for him. He could not let go of the pain that he saw coming from the nepotism and greed in the church. How we view a person or an animal, a dollar bill, or a chair is determined by the beliefs within our mind. Often those beliefs come from what we have observed or been told. We may not have originated those beliefs, but we are the keeper of them. Most of the evil thoughts we hold in mind were borrowed from others. They get passed around like viruses. Just as Michelangelo’s masterpiece eventually emerges. A real human also eventually emerges from beneath the lies that cover their loving Self. You can’t be impatient with these things. Michelangelo’s masterpieces often took months or years. They were not an overnight job. People often confuse short-term fixes with the process of revealing the True Self. Willing something into fruition is overpowering the evil within us, and it will reassert itself later on. Letting go of the evil is the real cure. Most people have filled their mind with tons of beliefs over many years. While they come out much faster than they went in, it still takes awhile to reveal that masterpiece. We have to be patient. Often Michelangelo had to chisel through lots of excess marble to get to that statue. Piles and piles of dust formed on the floor around him. As the True Self begins to surface, the person begins to know who they are. They look more alive and their body becomes healthier. Oddly, that which looked real and evil before, now seems like a dream or an illusion. Michelangelo described the process as freeing the statue inside. I’ve often used the same terminology except I chisel in order to free the REAL or TRUE person inside. And I must tell you, no matter how ugly someone is with all that extra stone on them, they are amazingly beautiful after it is removed. Once he had freed the statue from all the excess marble, what remained was beautiful, delightful to the eyes, and so much more valuable. Likewise, as the beliefs are chipped away from the person, a free one emerges who is beautiful, delightful to the senses, and so so valuable. 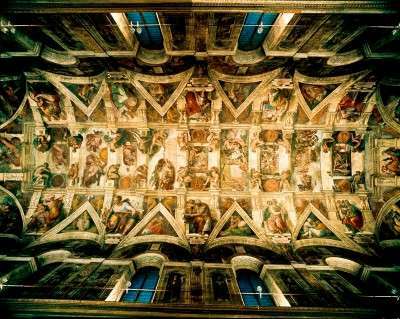 He could see how he had been tempted to do art that was not his true expression, such as the Sistine Chapel. Here is a bit more near the end of the poem. Even the great Michelangelo realized that the real sculpting is done to ourselves. Our outer gifts help us to perfect our True Self if we allow them to do so. I can only support others if I’m busy chiseling away at myself. And sometimes, it is the last thing I want to do. It is easy to believe that the goal of our life is to leave a legacy such as a business, a book, a work of art. But Michelangelo did that, and he shares with us what he learned. The revelation of our own true beauty and love is the point of life.